Special report Jeff Hawkins has bet his reputation, fortune, and entire intellectual life on one idea: that he understands the brain well enough to create machines with an intelligence we recognize as our own. If his bet is correct, the Palm Pilot inventor will father a new technology, one that becomes the crucible in which a general artificial intelligence is one day forged. If his bet is wrong, then Hawkins will have wasted his life. At 56 years old that might sting a little. "I want to bring about intelligent machines, machine intelligence, accelerated greatly from where it was going to happen and I don't want to be consumed – I want to come out at the other end as a normal person with my sanity," Hawkins told The Register. "My mission, the mission of Numenta, is to be a catalyst for machine intelligence." A catalyst, he said, staring intently at your correspondent, "is something which accelerates a reaction by a thousand or ten thousand or a million-fold, and doesn't get consumed in the process." His goal is ambitious, to put it mildly. Before we dig deep into Hawkins' idiosyncratic approach to artificial intelligence, it's worth outlining the state of current AI research, why his critics have a right to be skeptical of his grandiose claims, and how his approach is different to the one being touted by consumer web giants such as Google. The road to a successful, widely deployable framework for an artificial mind is littered with failed schemes, dead ends, and traps. No one has come to the end of it, yet. But while major firms like Google and Facebook, and small companies like Vicarious, are striding over well-worn paths, Hawkins believes he is taking a new approach that could lead him and his colleagues at his company, Numenta, all the way. For over a decade, Hawkins has poured his energy into amassing enough knowledge about the brain and about how to program it in software. Now, he believes he is on the cusp of a great period of invention that may yield some very powerful technology. Some people believe in him, others doubt him, and some academics El Reg spoke to are suspicious of his ideas. One thing we have established is that the work to which Hawkins has dedicated his life has become an influential touchstone within the red-hot modern artificial intelligence industry. His 2004 book, On Intelligence, appears to have been read by and inspired many of the most prominent figures in AI, and the tech Numenta is creating may trounce other commercial efforts by much larger companies such as Google, Facebook, and Microsoft. "I think Jeff is largely right in what he wrote in On Intelligence," said Hawkins' former colleague Dileep George (now running his own AI startup, Vicarious, which recently received $40m in funding from Mark Zuckerberg, space pioneer Elon Musk, and actor-turned-VC Ashton Kutcher). "Hierarchical systems, associative memory, time and attention – I think all those ideas are correct." One of Google's most prominent AI experts agrees: "Jeff Hawkins ... has served as inspiration to countless AI researchers, for which I give him a lot of credit," said former Google brain king and current Stanford Professor Andrew Ng. 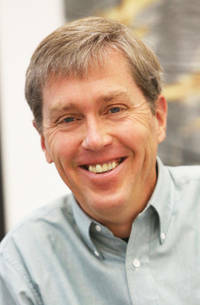 Some organizations have taken Hawkins' ideas and stealthily run with them, with schemes already underway at companies like IBM and federal organizations like DARPA to implement his ideas in silicon, paving the way for neuromorphic processors that process information in near–real time, develop representations of patterns, and make predictions. If successful, these chips will make Qualcomm's "neuromorphic" Zeroth processors look like toys. He has also inspired software adaptations of his work, such as CEPT, which has built an intriguing natural language processing engine partly out of Hawkins' ideas. Hawkins' idea is that to build systems that behave like the brain, you have to be able to take in a stream of changing information, recognize patterns in it without knowing anything about the input source, make predictions, and react accordingly. The only context you have for this analysis is an ability to observe how the stream of data changes over time. Though this sounds similar to some of the data processing systems being worked on by researchers at Google, Microsoft, and Facebook, it has some subtle differences. Part of it is heritage – Hawkins traces his ideas back to his own understanding of how our neocortex works – that's the part of the brain that handles higher functions such as conscious thought and language processing. His understanding of our grey matter is based on a synthesis of thousands of academic papers, chats with researchers, and his own work at two of his prior tech companies, Palm and Handspring. His approach seeks to model the structure of the neocortex, whereas most other approaches to artificial intelligence build upon the idea of a neural network, a model refined from a 1940s paper [PDF], A Logical Calculus of the Ideas Immanent in Nervous Activity. "[Neural networks] may be the right thing to do, but it's not the way brains work and it's not the principles of intelligence, and it's not going to lead to a system that can explore the world or systems that can have behavior," Hawkins told us. So far he has outlined the ideas for this approach in his influential On Intelligence, plus a white paper [PDF] published in 2011, a set of open-source algorithms called NuPIC based on his Hierarchical Temporal Memory design, and hundreds of talks given at universities and at companies ranging from Google to small startups.